The Week before last, I posted a You Tube video created by Ben Lucas entitled “Learn the 78 Tarot Cards in Two Hours. I hope you enjoyed the video and found it to be insightful As promised… part 2 of “Learn the 78 Tarot Cards in Two Hours”. (Part 2/2) Enjoy! This morning I drew the Knight of Pentacles upright. 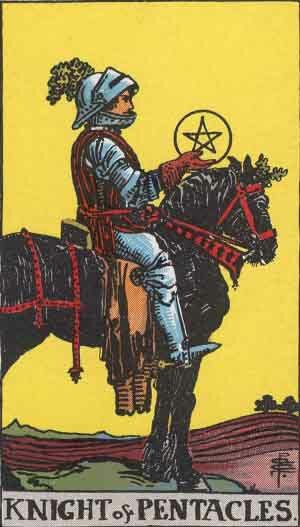 The Knight of Pentacles depicts a knight sitting in the middle of a field on a plow horse. In his right hand, he holds a pentacle. A plow horse is used for ploughing fields and other heavy labor which indicates that the Knight of Pentacles is a hard worker. Although the Knight of Pentacle is responsible, he is a slow-moving character, serious and stubborn. His focus is on handling day-to-day mundane activities such as work, environment finances and health. We’ll… I was feeling a bit overwhelmed with responsibilities regarding family, work and other extra-curricular activities such as family, work, finances and creating a successful blog. The Knight of Pentacles reminds me that although I am feeling overwhelmed, I should continue to work hard and focus all of the things that are important to live a good life, such as family, finances and health. 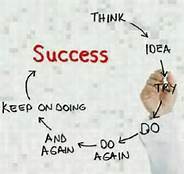 Staying focused on day-to-day activities will help me stay on course and successfully reach my goals. How do you think the Knight of Pentacles might apply to you in accomplishing your goals? Want To Learn the 78 Tarot Cards in Two Hours? I stumbled across the most amazing You Tube video the other day created by Ben Lucas. Who is Ben Lucas? We’ll I don’t know. Still researching. I do know that he created the most amazing video for tarot enthusiasts entitled” Learn the 78 Tarot cards in Two Hours. Ben’s You Tube video introduces the 78 Tarot cards and explains their various meanings and how the minor arcana numerically connects to the major arcana. I found this video very interesting and I wanted to share it with you. I posted part 1 of 2 below. Part 2 will be posted next week. Let me know what your thoughts are!